The teams were handed evaluation tyre sets to test in Friday's Free Practice sessions in Brazil so that the teams have some understanding of the tyres dynamics ahead of the 2013 season. Many teams were caught out by not only the degradation level but the tyres aerodynamic influence and loss of contact patch due to the shaping/profile of the tyre (loss of mechanical grip) at the start of 2012, which led to a narrowing of the field. The front tyre has caused the biggest headache to the teams as the shoulders of the tyre; wear disproportionally to the inner section of tyre. This is due to the design of the tyre and resulted in higher degradation levels as the drivers struggled to get and then keep the tyres within their operating window. As the teams have come to terms with the construction of the tyre they have reduced the air pressures affording a larger contact patch resulting in lower degradation. The lowering of the pressures will allow more of the tyre to sit on the tarmac giving a larger contact patch redistributing the wear laterally across the tyre. One of the other issues we have seen with this is that the tyres have tended to under rotate in the braking phase. This under rotation or locking causes a flat spot on the tyre compounding the drivers issues as he then has to carry a vibration for the rest of the life of the tyre. Although the change of profile won't completely eradicate under rotation/Front Locking it may go some way towards helping the drivers. The construction of the 2013 tyre to my eye seems to have a more bulbous sidewall which falls in line with the tyre being more forgiving vertically allowing for a more rigid and uniform tyre platform. It seems that Pirelli will likely giveth more contact patch with the new construction but taketh some wear life due to the increase in contact patch. Another words the tyre will give up more mechanical grip due to it's larger footprint but will do so for less time in order to give the teams a further challenge for their 2013 designs. I had wondered if Pirelli had adjusted the compound to further enhance this but Paul Hembrey has confirmed the hard test tyre used in Brazil is the same as 2012 hard compound. This however will change for 2013 with Pirelli adjusting all four of their dry weather compounds and so the test tyre used in Brazil isn't 100% indicative of next years offering. Aerodynamically a change in tyre construction will also lead to a change in the aerodynamic properties of the car. The teams ran Aero rigs throughout the practice sessions in order to evaluate the impact these alterations would have on their current setups. The teams will certainly make alterations to the Front Wings design in 2013 in order to adjust the airflow over and around the Front Wheel with the the largest visual change most likely being the Front Wing Cascades. The aerodynamic impact of the new tyres won't solely be limited to the front of the car and it will be interesting to see how much the rear of the car alters to combat more or less Tyre Squirt, whether more or less teams will adopt the Rear Wing Endplate holes (Like Williams, Force India & Marussia) and also the design layout around the brakes. From a mechanical perspective it will be interesting to see who follows Ferrari down the pull rod front suspension route especially with the revised tyre weight. Lets remember that the alterations to the 2013 Technical Regulations are limited and so initially Pirelli's aggressive stance could bode well for close quarter racing. Pirelli are also going to change the Hard tyres marking from Silver as it is widely agreed this is too close to the Medium (White Marked) tyres. 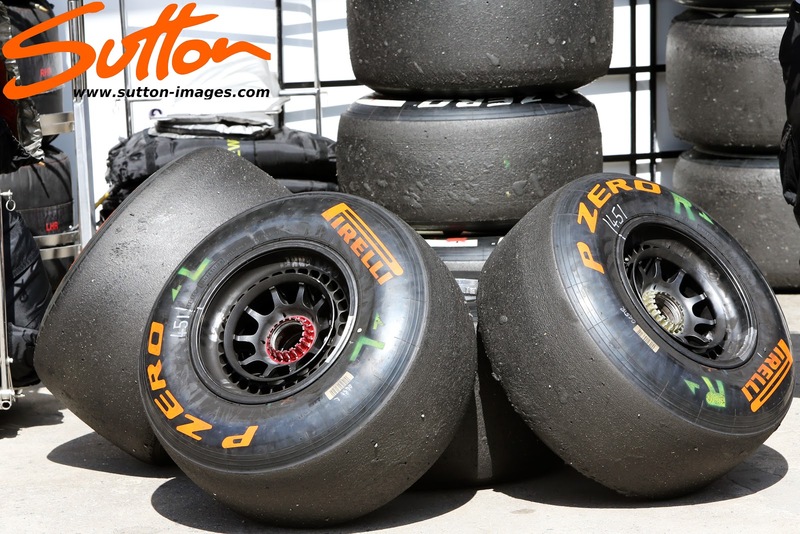 Fans and commentators alike have struggled when these two compounds have been used in unison and although the test tyres used in Brazil were marked Orange it's likely the 2013 tyres could bear another colour differentiator. I'd assume this means we'll see more deformation of the tyre whilst they're under load in places such as over curbs. Indeed that's exactly what we will see, the tyre will deform under load vertically but hold rigid across the tyre in order to continue giving grip. Yes this is a best option for buy car accessories online.Thanks for sharing this informative blog with us. Hey,excellent blog, it provide the information about Tyre patches, thanks for posting. Hi, I m CharlesMical. I would become so happy to your blog. If you want to know more about car tyre & bike tyre. Please visit to http://www.changemytyre.com. This is really informative. Nice Post which shared a great knowledge about Buy Tyres Online for Pirelli Tyres. I'll keep visiting for more of your posts.